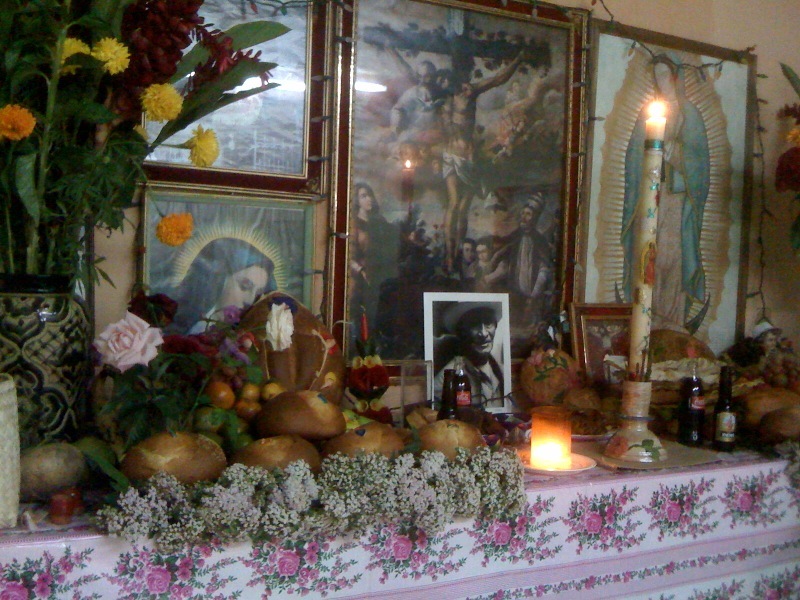 The elderly couple entered the altar room bearing a basket of bread (pan), chocolate, floras de muertos (an aromatic small white wild flower) and a tall beeswax candle made in the village. They lit the candle and replaced the new one in the large holder, careful not to let the flame extinguish. Incense burned and the warmth of candlelight wrapped the room even though it was only 10 a.m. They knelt in front of the altar where her dead father’s photo was the centerpiece, crossed themselves in prayer. 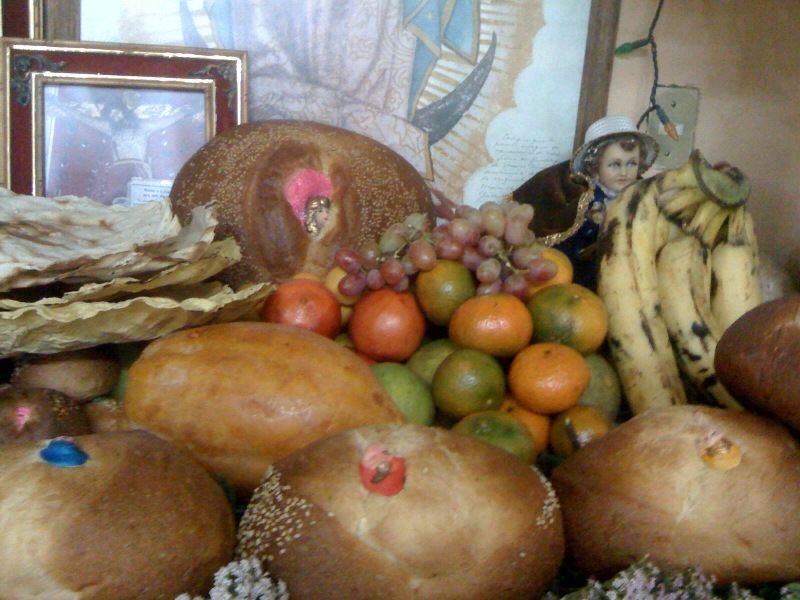 They then placed the flowers on the altar and the bread on top, adding another layer to the display of plenty. They joined the rest of the group assembled around the table and Fede offered all mezcal and a toast to the dead. What could I do but comply as a guest joining this intimate family gathering? Yes, of course. We raised the small shot glasses in salud (Spanish, to your health) and chisbayoh (Zapotec) to pay homage to the departed loved ones and to life. This would be the first time that I have had mezcal as a breakfast chaser! Around the table were aunts, sisters, cousins, godchildren, and their children. Fede, Dolores and Janet gave each guest a plate of sesame breads and hot chocolate. This was followed by chicken in mole and fresh tamales, and lots of conversation and laughter. The little ones played games and loved “spin the top” — a lottery game involving taking and leaving roasted pecans from the center pot, depending on where your spin landed. Janet explained that the tradition of games, bingo, lotteria, and shoots and ladders were typical for Dia de Los Muertos. 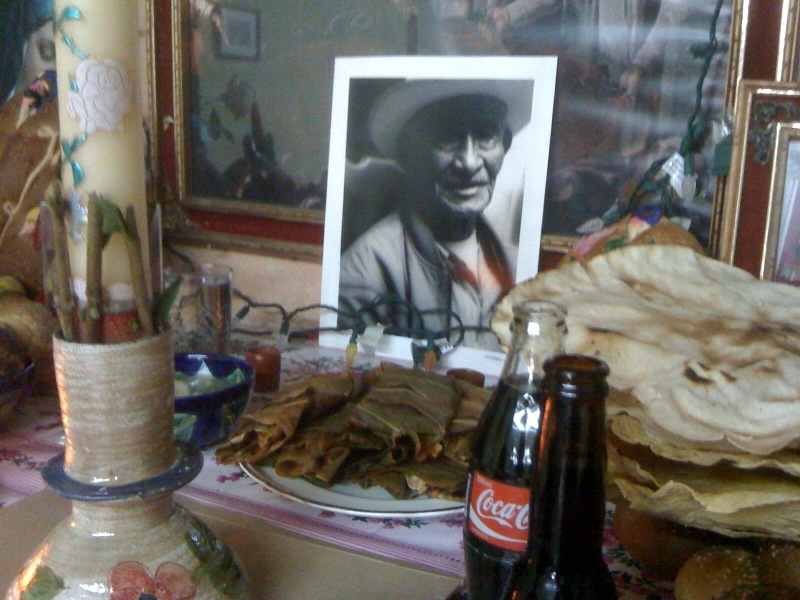 the intimacy of the celebration, the family gathering, the relaxation of visiting over time and the exchange of food is part of the authenticity of celebrating Muertos. We are fortunate to be a part of the family and included in the festivities. This entry was posted in Oaxaca Mexico art and culture and tagged Day of the Dead altars, dia de los muertos, Oaxaca, Teotitlan del Valle. Bookmark the permalink.